Will the current turbulence in the real estate market make boomers drop everything and list their home for sale in the coming months, or just scoot a little closer to the exits? How many were already counting on every dollar of equity based on their lofty estimates of value that are now in question? Do they pack it up and wait for a few more years? Or sell now while they can? The pressure is coming from many angles too – if it was just up to boomers having to survive on their own, they’d be fine, even if they had to cut back on the current lifestyle. It’s their parents needing the expensive assisted-living and the kids trying to get ahead that puts the additional strain on boomers, and could make them sell their house. It’s a curious topic for those around housing – how will it all play out? 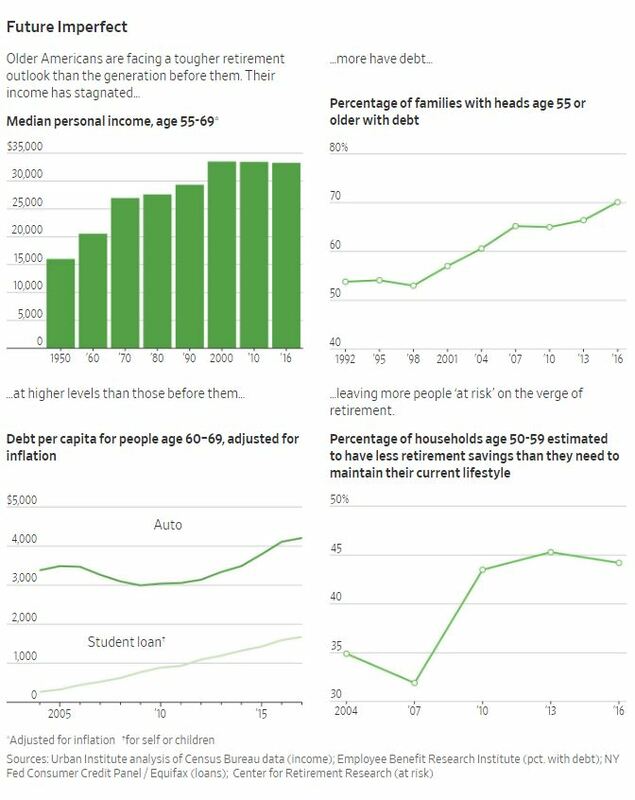 •The percentage of families with any debt headed by people 55 or older has risen steadily for more than two decades, to 68% in 2016 from 54% in 1992, according to the Employee Benefit Research Institute, a nonpartisan public-policy research nonprofit. 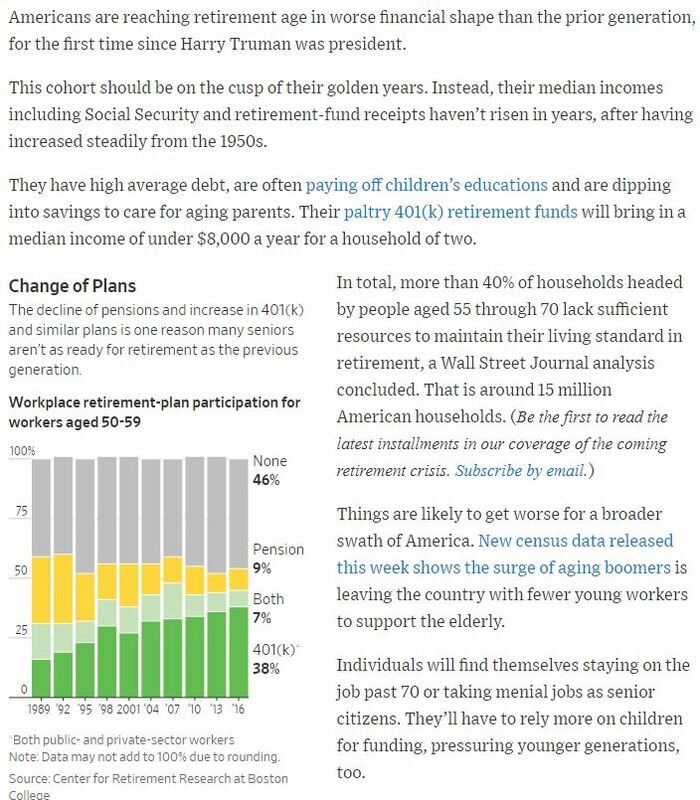 •Americans aged 60 through 69 had about $2 trillion in debt in 2017, an 11% increase per capita from 2004, according to New York Federal Reserve data adjusted for inflation. They had $168 billion in outstanding car loans in 2017, 25% more per capita than in 2004. They had more than six times as much student-loan debt in 2017 than they did in 2004, Fed data show. A combination of economic and demographic forces have left older Americans with bigger bills and less money to pay them. Tempted by a prolonged era of low interest rates, boomers piled on debt to cope with rising home, health-care and college costs. Interest-rate declines hurt their security blankets. Lower earnings on bonds prompted many insurance firms to increase premiums for the universal-life and long-term-care insurance many Americans bought to help pay expenses. Some public-sector workers are living with uncertainty as cash-strapped governments consider pension cuts. Gains in life expectancy, combined with the soaring price of education, have left people in their 50s and 60s supporting adult children and older relatives. Some are likely to have to rely on professional caregivers, who are in short supply and are more expensive than informal arrangements of the past.